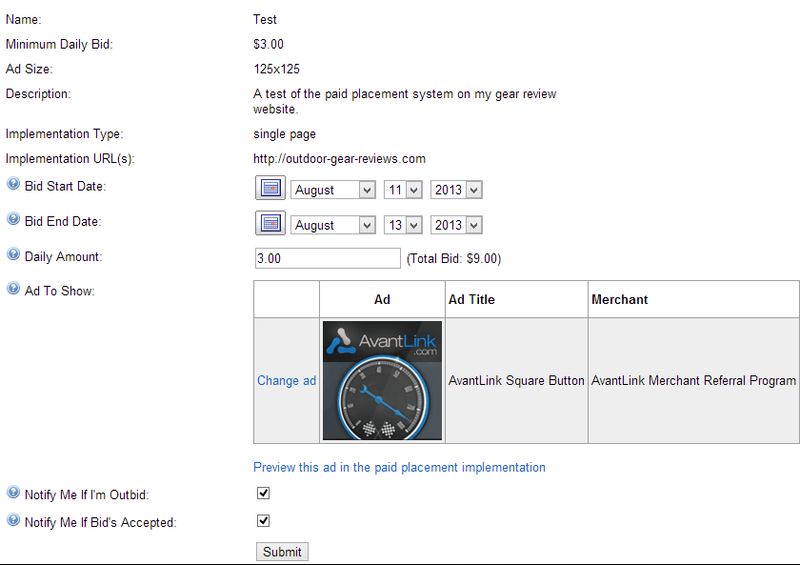 AvantLink’s Paid Placement Bidding System is Live! The Paid Placement Bidding System was developed to help merchants get priority ad placement on high-value publisher websites by way of bidding for that placement. Publishers benefit by setting aside allocated ad space for merchants to bid on in daily increments, allowing for upfront investments on their priority ad space as well as upside commission payouts for referred sales. Many publishers do not want to manage the tedious process of negotiating paid placement rates, invoicing the merchant, posting the appropriate ads, etc. 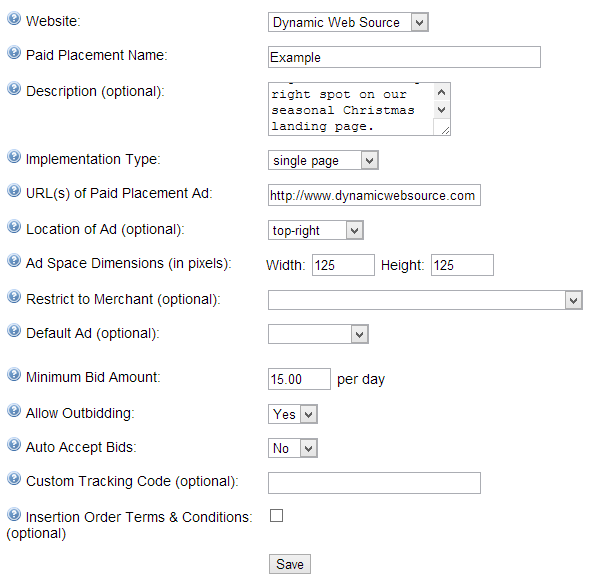 The Paid Placement Bidding System streamlines and automates the distribution of ad space to the highest merchant bid. Merchant/advertiser bids are made to secure ad space on publisher sites for 24 hour increments. Merchants can out bid one another for future 24-hour blocks of placement dates. allocate a specific amount of ad unit space on your site for the placement. choose common banner ad unit sizes (125×125, 728×90, 120×600) to increase chances of securing bids. Ad Space Dimensions: As noted above picking a standard ad unit size is important. Try creating a placement offer for a standard banner size, rather than an uncommon size merchants may not have available. Default Ad: If an active bid is not in place you can rely on a default place holder banner ad of your choice (from any ad network). Minimum Bid Amount: This is the minimum bid amount you will accept for a 24-hour period. While the bidding process plays out, the default ad unit you selected will be displayed. you can be outbid by other merchants for any placement up until 11:59pm the day before your ad goes live. you can bid for multiple days at one time, but again, you can be outbid by other merchants for any future dates. all bids must be accepted by publishers before they are locked in. The sample screengrab below shows placement offers submitted by publishers. We provide merchants with the same search and sorting options at the top that are found in the affiliate application management and affiliate recruitment tools. When you find a publisher placement you would like to bid on, click the name of the bid on the far left column (titled “Name” in sample image) and will be taken to the bid configuration screen seen below. Ad Space Dimensions: You can only complete a bid if you have a current banner ad that fits the allocated size and area the publisher has specified. Live Bid Preview: Click “Preview This Ad In The Paid Placement Implementation” to see how your ad will look if your bid is accepted. Notification Options: Get instant notifications if/when your bid has been accepted, or outbid by another merchant. Once you have configured and submitted a bid our system will take care of the rest. When/if the publisher accepts your bid, it will be placed on the main paid placement overview screen which can be found by clicking on “Merchant Tools > Paid Placement > View Current, Future, And Past Bids. As always questions, comments or suggestions encouraged. Happy bidding! ← Previous Previous post: Chaparral Motorsports Affiliate Program Live @AvantLink! Next → Next post: AvantLink Canada’s Paid Placement Bidding System is Live! This could be a great resource for my site as it grows. I assume I don’t yet have the traffic to attract many Merchants, but I’ll give it a go and see what happens. I hope you do a Webinar on it, I’d like to hear about best practices for using it. Thanks for the great new service. Thanks for the great feedback- we’re glad to hear this platform will be useful to you. We’re going to have a training webinar on the paid placement system this Friday. We’ll be announcing it shortly on the blog, probably mid afternoon today. Thanks! If a merchant wins a bid for say one month of advertising at a low price, but then the traffic increases and the space becomes more valuable, do other merchants have to wait for the end of the month before they can rent the space? i.e. can the space get locked in at a low price for ages or does it go to the highest bidder on the day, every day? Great question, MB, and the answer is it depends on the affiliate and if they allow for outbidding by merchants or not (which the vast majority do). If you allow for out bidding by other merchants, and Merchant A has bid on your space for an entire month, Merchant B can come in and outbid for that space for any day, week or whatever time period they want to take the spot away from Merchant A. What is the revenue split with avantshare? Hi Chris, can you please answer: What is the revenue split with avantshare? Thanks. AvantLink’s fee is 10% charged to the merchant. Take a typical example of a $1.50 placement charge. At that point the merchant would be billed the $1.50 and $0.15 for the placement. Thanks for answering the question Chad. That is a very reasonable fee! I thought it would be a lot higher. Hi Chad – quick question: We have some prime real-estate on our site, but generally rotate 2-3 campaigns in those spots. Do these paid placements have to be the sole ad in a given spot or would we be able to insert them (fully disclosing that they’d be in a rotation in the offering description) in to our current rotation? Tal-ee, that’s a great question. No, it doesn’t have to be the sole ad in the placement, but like you said, that needs to be completely disclosed in the description. We have several affiliates who are doing a rotation method like this right now and it has worked out well. Thanks for the quick response Chad and that’s great to hear! The reason I ask is because the ones I had set up in a rotation don’t seem to be “activating”. We’ve looked into your paid placement spots and have a few troubleshooting bits of info that we’re seeing. If you can send an email to our support team (in your account interface under the “Support” section where it says “submit a ticket”), we’re happy to get those “activation” issues sorted out. Hi SnowShoeFan- glad to hear you got started with a Paid Placement. For requests like this, it’s best to send them into our support team. You can do this by logging into your AvantLink account, click on ‘Support’ at the top right, and then choosing the ‘Submit a Support Request’ option. Thanks!